*Please check building codes in your area to assure proper procedures before attempting this project. 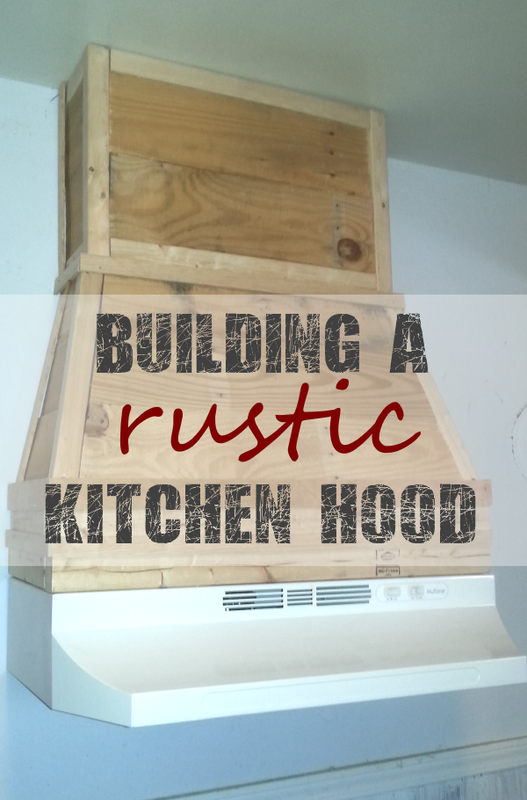 I built the kitchen hood in three parts working from bottom to top. First, I started with a hood from Home Depot given to me by my parents. They were in the middle of remodeling their kitchen and decided to change hoods. There was nothing wrong with the hood other than the color. Their new kitchen appliances were stainless and black making their newly purchase hood stand out like a sore thumb. Because they previously installed the hood, they didn’t return it to Home Depot. Instead, they gave the hood to me to use in my kitchen. Nothing wrong with a hand-me-down, right. I decided to spray paint the hood using black appliance paint from Home Depot after purchasing new stainless steel appliances for the kitchen. Again, the hood stood out like a sore thumb. Not for long! The top of the metal hood measures 30 in. x 12 in. 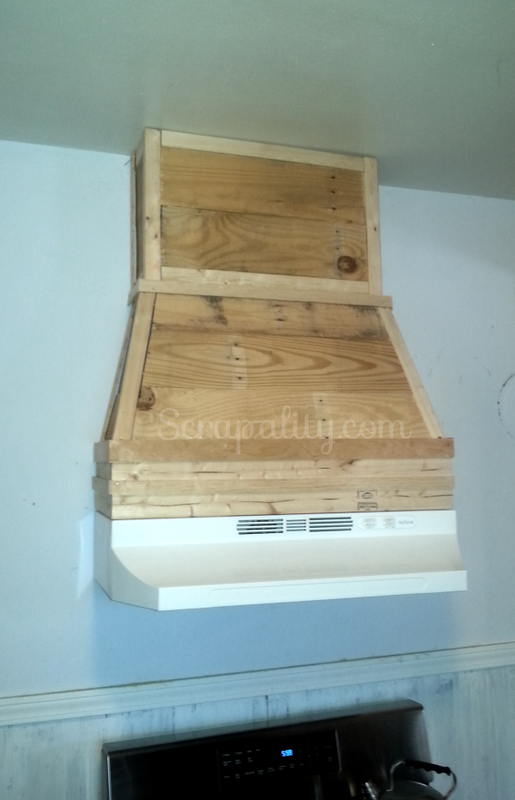 Since the metal hood attaches to the wooden hood, the wooden hood needs to be the same size. Also, keep in mind, the hood needs to be between 24-36 inches above the range. I measured and cut the 1×3’s to fit the top of the metal hood. To attach all of the parts together, I used a Kreg Jig for a tight fit. Once the bottom of the frame was together, I attached it to the studs using 3-inch screws. Then, I created the top by making a box using ferring strips. 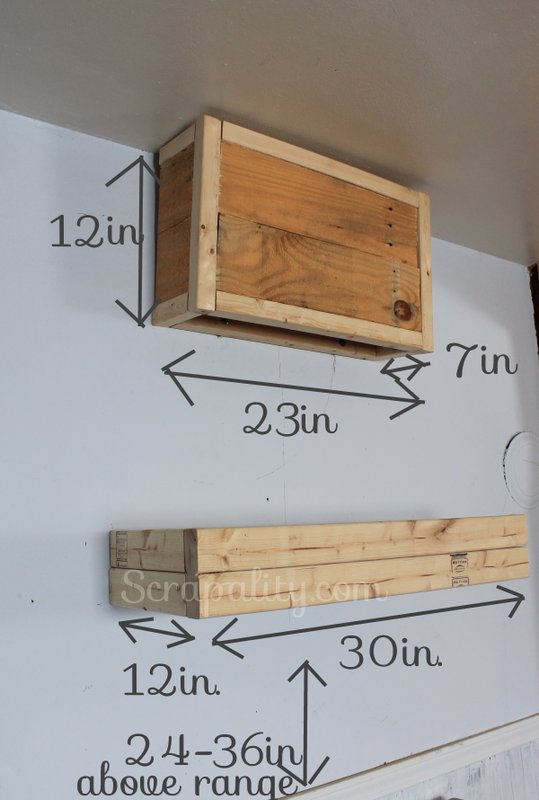 Using the Kreg Jig, I attached lightly sanded pallet boards to the ferring strips to the sides and front of the box. 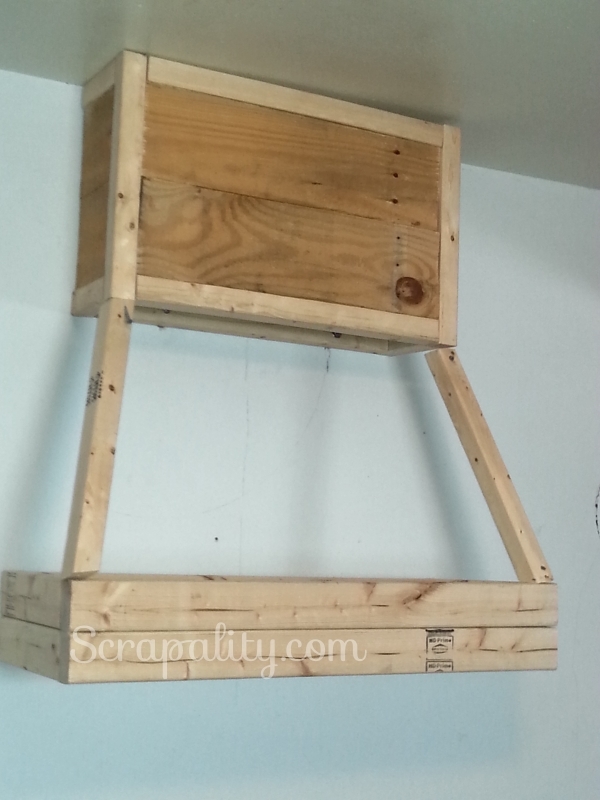 The wall studs were not in an ideal location for the top, so I mounted the top using wall anchors. For the middle, I played with a few ferring strips by cutting the angles using a miter saw. This part took a while to get the right angles to fit. If you look at the above photo you can tell I was having a little bit of a hard time. But, after a few tries, it worked out. After I was happy with my angles, I attached the pallet wood panels to the ferring strips and screwed the middle section in place. To finish the look, I purchased molding to cover seams and add dimension. Notice the white hood? After finishing the hood, I removed the metal hood and gave it a fresh layer of paint while I stained the newly built hood. I like this idea. Does it makes the room feel taller? No, I don’t think it makes the roof feel taller. But, the room is fairly good size. Thanks for stopping and leaving a comment. Thanks, Trisha. You can do it! This is beautiful, it would add warmth to any room. Thank you for the tutorial. That is if a stove hood would not look out of place anywhere other than a kitchen. That is AWESOME, Andrea! I love all your pallet projects but this one is really genius! Thanks, Megin! It’s always a privilege to be featured. Thank you. I’m glad you enjoyed the tutorial. Wow, what a transformation. This looks amazing. Great detailed tutorial too! Thanks for sharing at the #HomeMattersParty – hope to see you again this weekend. Thank you and thanks for visiting. See you next party. How cool is that! Thanks for joining Home Sweet Home! I’m confused. The hood in the pic. Is white and the stove is black. Pictures don’t match the story. Can I really be the only person to notice this?